Natural killer cells of the immune system can fend off malignant lymphoma cells and thus are considered a promising therapeutic approach. However, previous studies show that in the direct vicinity of the tumour they lose their effect without a full understanding of this mechanism. Now, researchers of Helmholtz Zentrum München have now elucidated which mechanisms block the natural killer cells and how this blockade could be lifted. The is study is published in the European Journal of Immunology. Previous studies show that natural killer cells (NK cells) are part of the immune system and provide an innate immunity against exogenous and altered endogenous structures. This also appears to apply to tumour cells, against which the body could develop immunity as it does against pathogens, e.g. against viruses. Tumours of the lymph nodes, called lymphomas, are malignant neoplasms that originate from the B cells or T cells of the lymphatic system. B cell lymphomas are very difficult to treat, which is why innovative approaches to therapy are needed. Earlier studies have shown that NK cells have the potential to attack B lymphoma cells and are therefore considered a possible approach to new treatment strategies. In the living organism, however, tumour control by NK cells has been found to be clearly limited. The current study validated previous findings that the NK cells in the immediate vicinity of the tumour showed reduced function. The data findings showed that when the cells were placed in a normal environment, their function could be restored within a few hours. These results suggest that the factors responsible for the inactivation of the NK cells derive from the tumour itself. The team identified two important tumour-specific factors that are associated with impaired NK cell function. First, a specific inflammatory cytokine (IL-10) is indirectly involved in the inactivation of NK cells. Second, the tumour cells develop protective mechanisms against the NK cells. Therefore the researchers state that they have showed that specific surface molecules of the tumour cells (NKG2D ligands) which NK cells could bind are down-regulated. They explain that the NK cells lack an important activation mechanism and are no longer able to carry out cytotoxic activity. Despite the inhibitory strategies of the tumour cells, at an early stage the NK cells produce the cytokine interferon-gamma (IFN-γ), the team state. The results show that IFN-γ is essential to activate further immune responses that support the fight against the tumour. The team surmise that the transfer of NK cells is a possible strategic option to treat B cell lymphoma. According to the findings, this therapeutic approach can be optimized when transferred NK cells are already activated in vitro prior to their injection, thus bypassing the missing activation potential in the tumour microenvironment. They go on to conclude that an additional injection of IFN-γ or of antibodies against IL-10 could further support the immune activity. 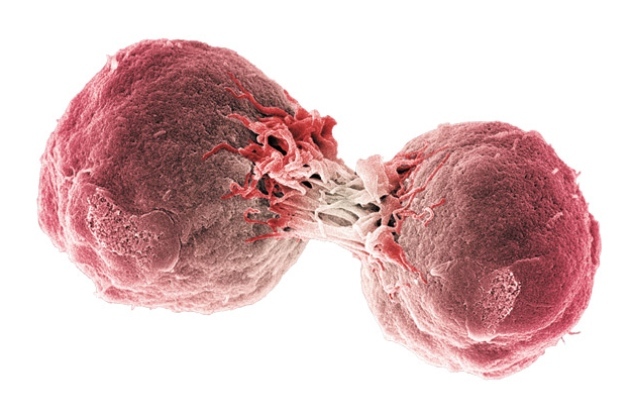 A lymphoma cancer cell dividing. Based on the type of immune cells affected by lymphoma it has been subdivided into dozens of subtypes. Copyright 2015 All rights reserved biological 360.